I just got an info about someone who has not slept in three days, all because of expecting ‘big things’ on feburary 14. Hey! Just let it calm because ‘great things’ is happening this weekend in the Premier League and the battle between Tottenham and Manchester City is too crucial to be left off the radar. Yeah. Glo. Nigerian’s big telecom company part ways with the Nigerian Professional Football League after its mutual relationship interms of sponsorship and support since 2003. Glo’s contract was renewed with the League Management Company (LMC) in the 2012/13 season and also did well over the years to sponsord the Nigerian National team and supporters club, although the Football Federation is seeking for multi-sponsorship deals. ‘Big things’ keep rocking Nigeria, apart from the political scene and the story of a bread hawker who turns celebrity model in two weeks (nothing is not feasible in Nigeria), yes the 2016 Npfl ball have been unveiled! Its not Jabulani you will see it Feburary 21st when the League kick-starts. NEXT! (That word you hear in music audition)… Its the case of Sunday Oliseh v NFF (Technical Commitee et al…) After a video rant an apology, a seven-days ultimatum from Sport Writers Association of Nigeria (SWAN). I will suggest the next to be Nations Cup qualifiers. Thanks. Fabio Canavaro, Italy’s World Cup-winning captain has been sacked as manager of Saudi Arabian side Al Nassr after just four months in charge. Cannavaro won six of 14 games as boss, and leaves the defending champions sixth in the Saudi Pro League, 18 points behind leaders Al Hilal. Costa’s nose is damaged- he joins the league of Zorros. Easy. Easy he just got a broken nose, Diego Costa according to Guus Hiddink had a broken nose during training in camp after a head clash and would wear a mask like Nemanja Matic and Ceasar Aspilicueta against Newcastle. 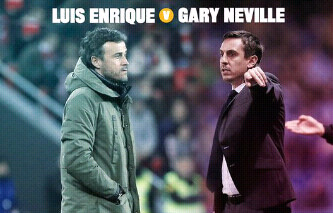 When i say ‘Gary’ you say ‘Neville’. Well the former England international has been in charge of Valencia for a while now and have not recorded a win since he has been leading the team to battle. Last game was a draw 1-1 after first leg’s 7-0 against Barcelona.